National mapping organizations streamline product creation and services to help people solve problems. swisstopo readily keeps maps up-to-date with ArcGIS. Dutch Kadaster reduces map production time by 5,000 percent. National mapping organizations (NMOs) are in charge of creating authoritative products and services that help people understand where things are and what is happening there. This information helps people in government, business, and everyday life solve problems. The automated flow of 1:10,000-scale data through geoprocessing models to produce product-specific generalized data. Two NMOs in particular, the Swiss Federal Office of Topography (swisstopo) and Dutch Kadaster, the national land registry and mapping agency for the Netherlands, have the strategic goal to use common databases and production environments for all their maps enabled by the ArcGIS platform. Both organizations chose ArcGIS after using other solutions. They found that the ArcGIS platform can transform map production with geoprocessing, including generalization, automated text placement, symbol-level drawing, and printing and overprinting, to radically cut the time required to produce maps. The ability to apply technology in such an efficient manner and produce great cartographic results is one of the many designed goals for the ArcGIS platform. These two mapping organizations exemplify the “capture once, use many times” way of thinking. There are many ways to implement cartographic workflows, but there are several common themes these organizations have discovered using the ArcGIS platform. swisstopo has a unique, highly regarded style of cartography. The production process integrates photogrammetry with geoprocessing production workflows. swisstopo staff publish topographic map series in scales from 1:25,000 up to 1:1,000,000 using a topographic landscape model (TLM) as the repository for comprehensive accurate vector data. Before adopting ArcGIS into the production workflow, it took swisstopo staff considerable effort to keep all the maps up-to-date. Today, to simplify the work of the cartographers, the links between the vector data captured photogrammetrically and the cartographic products are maintained. The swisstopo central production environment is called TOPGIS, and it is the foundation that integrates photogrammetry and 3D GIS to produce many products from one database. Each map product’s production process has a unique digital cartographic model (DCM), which uses data from the TLM that has been transformed to become the product-specific symbolized data. This is important when changes in the real world happen, because it increases the efficiency of necessary updates. The workflow that transforms detailed data into swisstopo's map and data products. A whole suite of DCMs are used to create different map products. Each DCM corresponds to one of the many map scales required. The office creates many printed products, like the Swiss national map series, which among other things is an excellent resource for hiking in the Alps, as well as digital products like SwissMap Online. Today, using ArcGIS, swisstopo has improved its map currency and the world-renowned quality of its cartographic products. Dutch Kadaster is the national land registry and mapping agency for the Netherlands. The organization surveys, registers, and performs land consolidation, as well as providing mapping and information services for the country. Dutch Kadaster staff members have transformed their mapping process by implementing the ArcGIS platform to create and maintain standard topo- graphic data and maps for the country. For years, Dutch Kadaster has maintained its Top10NL, a 1:10,000-scale topographic geodatabase of all of the Netherlands. Now the highly skilled geoinformation development team adopted new innovation concepts in close cooperation with users. ArcGIS was configured out of the box to completely automate derived map production by creating sophisticated models that reflected the cartographer’s vision with no customization. 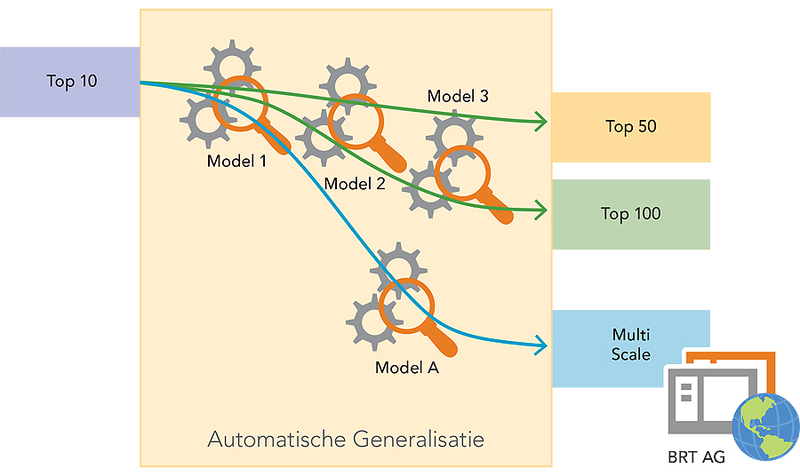 Both Kadaster and its users benefit from the implementation of a fully automated generalization production workflow. The automation of manual cartographic labor led to a significant cost reduction. Using the new procedure, Kadaster produces the 1:50,000-scale map series at one-fourth of the original budget. Processing time has been reduced tremendously and has increased the update frequency of the derived map series from a six-year to a two-year cycle. This is fully in sync with base data acquisition—the source dataset at 1:10,000 scale and derived map series at 1:50,000 scale are released simultaneously five times a year. Map content itself is optimized by applying generalization algorithms consistently for the whole country and by improving the base dataset and algorithms after each development and production iteration. Using ArcGIS, including tools for map automation and generalization, Dutch Kadaster realized a 5,000 percent savings in the time required by traditional cartographic methods for map production. Ultimately, the users are the real beneficiaries of this innovation: getting real maps more frequently at lower costs. For more information, check out the poster [PDF] to see eight important features both of these agencies used to define their map production processes to help usher in a new era to cartographic design and efficiency. Also, contact Mark Cygan, Esri (tel. : 909-793-2853, ext. 2333).